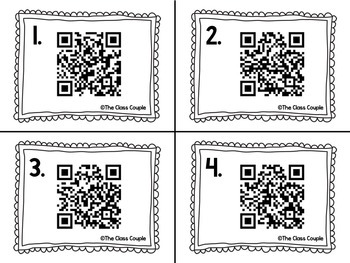 Use QR codes to increase student engagement while they are applying their phonics skills! 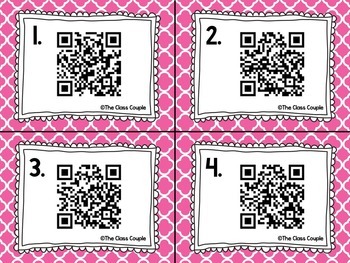 Cut out and laminate the cards, and place in a center, or around the room for a scavenger hunt! Then have the students use their device (iPod, iPad, etc.) with the QR code reader to scan the code. Students will then write the word that goes with the picture, or that best completes the sentence on their recording sheet. 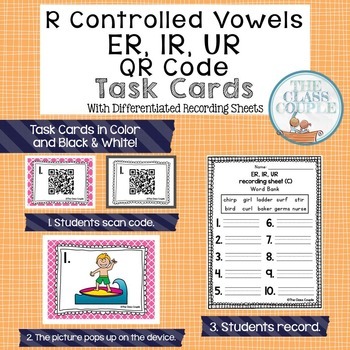 This set has 10 different QR codes all with r-controlled vowels er, ir, and ur words. There is a color and black and white option for printing the task cards. I have included three different types of recording sheets: Sheet A has plain lines to write the words on, Sheet B has the amount of spaces to go with the letters for the word (ex. 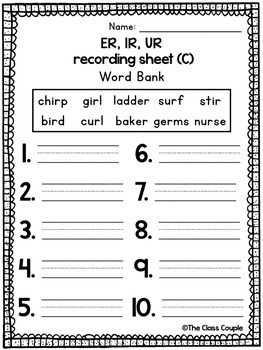 4 spaces = 4 letters), Sheet C has a word bank that the students can use to help when writing the words. An answer key is also included, along with a QR code that students can scan to take them to an answer key if you would like to have them check their work when finished. I hope you find this product helpful when implementing technology and phonics skills in your classroom. Please feel free to email me with any questions you may have! Follow me on Social Media to see products in action!